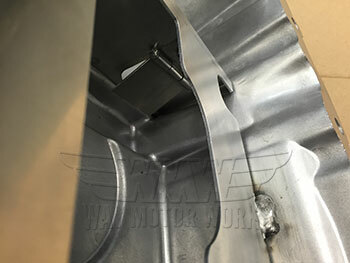 WMW is proud to offer our New Baffled oil pan for your R50 R52 or R53 MINI Cooper and Cooper S. We've been racing for years and with a few good ideas we came up with this simple but effective baffle system. It has a couple trap doors that allow the oil to get to the oil pump pickup and stay there no matter if your cornering, accelerating, or braking. If you have a track MINI this is a must have. 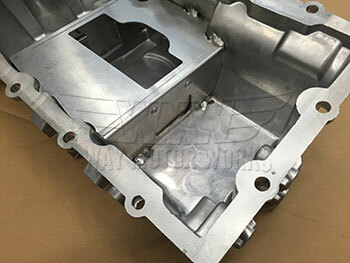 We have made this with one solid aluminum sheet lazer cut to the exact shape of the oil pan. Then we installed 3 one way trap doors to keep the oil around the pickup instead of sloshing away and causing oil starvation with possible engine damage. Also if you have the typical leaky oil pan gasket replace this at the same time just for the upgrade. Includes NEW oil pan with baffles installed.